Almost four and a half years after it was listed on the NYSE, Twitter posted its first profitable quarter ever, reporting profits of $91 million in Q4, 2017. For the full year, however, the company still made a GAAP net loss of $108 million. Revenues came in at $2.4 billion during FY17, a decrease of 3% year-on-year. During the last quarter, however, the company earned revenues of $732 million, an increase of 2 percent over Q4, 2016, when the company had earned revenues of $717 million. The positive news helped the company’s stock soar 30 percent at one stage, hitting $35 at the NYSE. The stock finally closed at $30.18, up 12.11 percent over Wednesday’s closing. The enthusiasm stemmed from the company beating analyst estimates in terms of its financials, but many are already pointing at the fine print that seems to show that Twitter didn’t add to its user-base during the quarter. 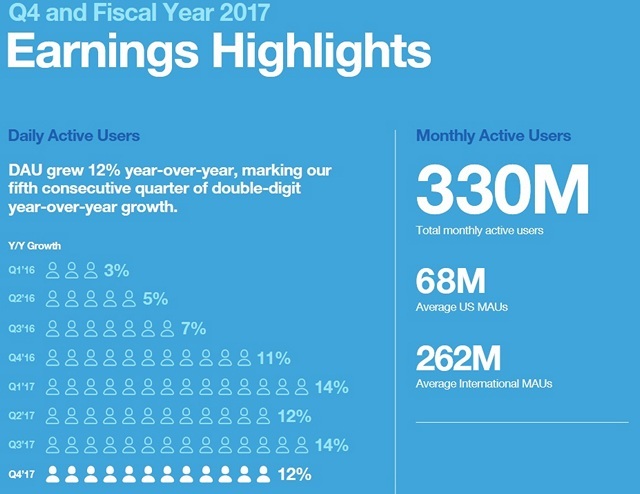 The existing users, however, are seemingly logging-in more often, with the MAUs (Monthly Active Users) for Q4 rising to 330 million, an increase of 4% on a YoY basis. The company’s DAUs (Daily Active Users) apparently also increased by 12 percent, representing its fifth straight quarter of double-digit growth. Strangely, however, unlike Facebook, Twitter didn’t report exactly how big that number is. Whatever little growth Twitter has had in its user-base came from outside of the US, with its USA MAUs actually dropping to 68 million in Q4 from 69 million in Q3. However, a lion’s share of the revenues still came from US users, with the company reporting that these users accounted for around half its overall revenues.